I am terribly late with this post. I thought I had scheduled it but this morning when I came to check, I didn’t have any post published! Then I realised I did not schedule this post! My apologises. It is here now! Winnie & Walter celebrate every month! Each month a product is featured with plenty of inspirations from designers using that product, a month long sale of that product and a challenge. There is also a new giveaway. You will not want to miss it. 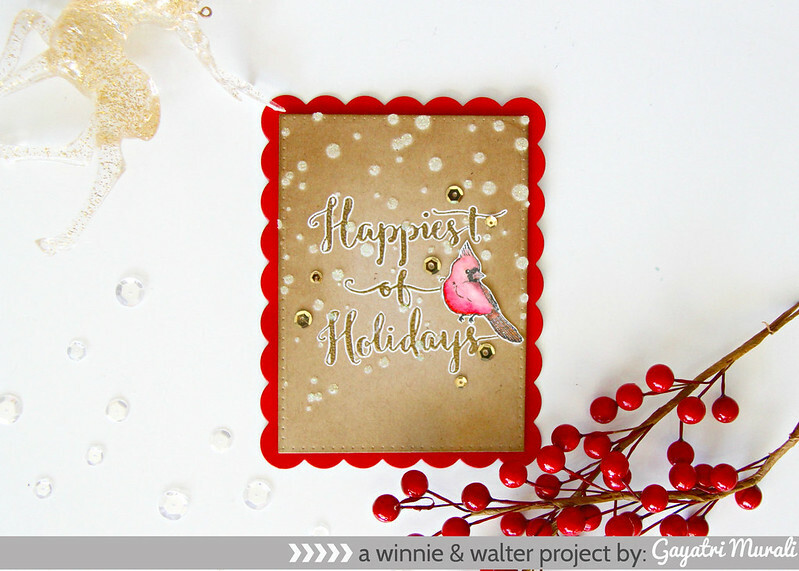 This month’s featured stamp set is called Happiest of Holidays with Evelin T Designs. Love the handwritten sentiments and hand drawn images on this set. Here is my card using the images from the stamp set. I made the sentiment from the stamp set the focal point and highlight of my card. I die cut my kraft panel using the largest rectangle die from Katharine Cutaway. 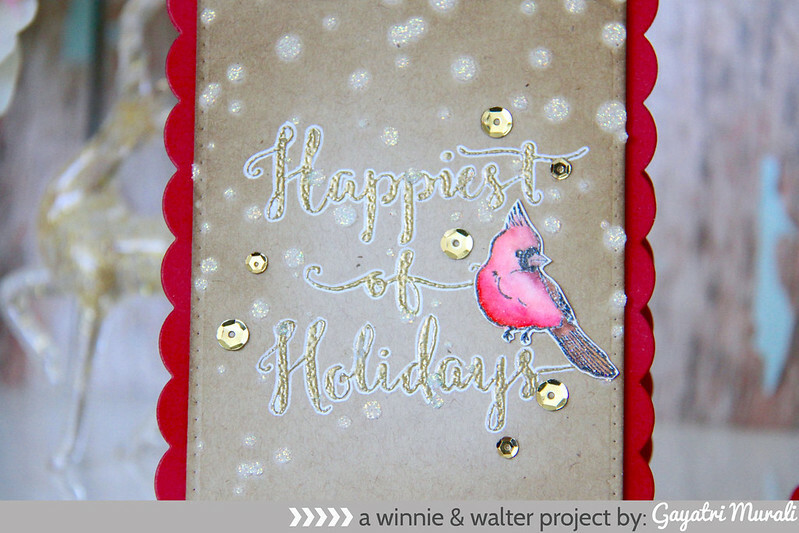 I gold heat embossed the sentiment from Happiest Holidays with Evelin T Designs on the centre of the panel. Then I used Scenery: Big Bang Circle Creative Screening and Novo Glimmer Paste Moonstone to add some snow and texture to the background. I felt both the snow and the sentiment were not making any impact. They kind of blended into the kraft cardstock. So I sponged some Gathered Twigs distress ink on the edges of the kraft panel and went around the sentiment with white gel pen. That brought out the sentiment. I black heat embossed the robin bird from the stamp set, watercoloured the image and handcut out to add on the panel. My card base is made out of red cardstock die cut using the largest scalloped rectangle die from Noelle Cutaway. Love the kraft colour matted with red colour. I adhered the kraft panel using foam adhesives. I embellished with Pretty Pink Posh gold sequins to tie in with gold sentiment. Oh I love this set it is stunning. I love. Thanks for sharing this sweet holiday card with us!